Peggy Gavin’s new book The Cat Men of Gotham: Tales of Feline Friendship in Old New York (Rutgers University Press, 2019) looks back to the nineteenth century in New York City, when humans dealt with feline overpopulation by gassing unwanted cats or tossing them in rivers, and the people who rescued them from the streets and welcomed them into their homes and hearts. This book tells the stories of beloved feline companions. The book also looks at extraordinary cats as well, from Chinese stowaways prowling the Chelsea Piers to the sole feline survivor of the USS Maine explosion. Among the forty-two profiles, are many feline Cinderella stories, as humble alley cats achieved renown as sports team mascots, artists’ muses, and even presidential pets. 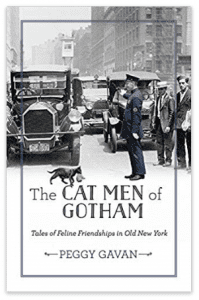 The Cat Men of Gotham will gives readers a new look at Old New York and the people and animals who made it their home. Peggy Gavin is a journalist and senior editor who lives in Warwick, New York. She is the author of several children’s books and the blog The Hatching Cat: True and Unusual Animal Tales of Old New York, which has been profiled in Newsweek and the New York Times.